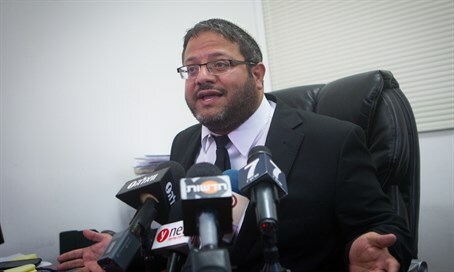 Attorney Itamar Ben-Gvir demands immediate end to investigation after suspect confesses under duress, calls for investigation into ISA. Attorney Itamar Ben-Gvir, who is representing Jewish suspects arrested over the Duma arson attack in July, announced Tuesday morning that the main suspect provided evidence that the Israel Security Agency (ISA or Shin Bet) sexually harassed him during the course of their interrogations. "The sexual harassment against my client damages all that is sacred to him, his values of Torah observance and the commandments," Ben-Gvir stated, adding that his client had been sleep-deprived for an extended period of time. "After the interrogators passed the initial stages of interrogation and my client stuck to the truth, they simply received a license to kill," he continued, adding that the interrogators may have sodomized him. "At some point four thugs entered his room, beat him, and tied him to his bed." "The descriptions are shocking and appalling: they tied him upside down and beat him again and again, until he screamed 'Enough! Leve me alone, let me go, I didn't do anything!'" Ben-Gvir said. "They broke him. I believe very much that there are doubts that any confession he made are usable in court. They beat him into a shadow of a person." "I am ashamed of the State of Israel in 2015, that this is the conduct of ISA interrogators," he fired. "I am ashamed that the prosecution and the Legal Advisory gave a free hand to this." "I am ashamed that some judges conformed to this terrible reality, were indifferent or even ordered to bring him to court in those last days of torture," he added. "My client needs a psychiatrist and medical care." Ben-Gvir demanded an immediate end to the investigation because his client confessed only under extreme duress. "The things my client said have no weight, because any person in this situation would admit to anything," he added. "I think that each and every citizen of Israel would admit the charges against him under such circumstances."